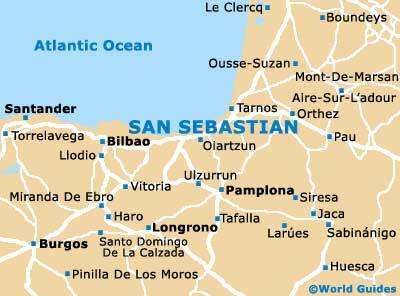 San Sebastian is a historic city, known for its beautiful buildings and rich heritage. However, San Sebastian also offers an extensive calendar of events, with many prominent festivals held around the city, throughout the year. When visiting San Sebastian, be sure not to miss the La Tamborrada drum parades in January, carnivals and Tinker Day in February, the popular Beer Fest in June, and the Jazzaldia (San Sebastian Jazz Festival) each July - which has become of the Spain's most important events of its kind. Also worth noting, the San Sebastian International Film Festival in September is a major event, attracting many famous celebrities to the city. Cabalgata de los Reyes (Three Holy Kings / Wise Men) - January 5th, with three locals dressed as kings riding around the streets on horseback, starting from the Town Hall, delivering gifts to crowds of eager children. Crafts Fair - mid-January, local handicrafts event with a large marquee based around the Koldo Mitxelena Library. Bertsolari Festival - mid-January, a traditional Basque poetry event, held at the Kursaal Auditorium. San Sebastian International Cross Country Race - mid-January, attracting many noteworthy athletes, at the Zubieta racecourse. La Tamborrada - mid-January, one of San Sebastian's most famous festivals known for its high decibels, with crowds of drummers marching around the streets throughout the day and night, starting at the Plaza de la Constitution with huge crowds in the evening, after various dinners around the city. La Tamborrada is usually held the day before San Sebastian Feast Day. San Sebastian Feast Day - late January, the Patron Saint's day, featuring various parades, parties, races, and celebrations well into the night, particularly concentrated around the Plaza de la Constitución. Cycling - late January, important annual cycling event held at the Anoeta Velodrome. Caldereros (Tinker Day) - early February, with parades and street parties remembering the historic arrival of Hungarian gypsies in San Sebastian, when hundreds of locals dress as gypsies. Other highlights include singing, colourful gypsy caravans and general festivities, just before the carnival. Carnaval - early February, a popular Spanish carnival celebration, with parades and festivities in San Sebastian since the late 1970s. Nursemaid's and Shepherd's Day - early February, held after the Tinker Day parade, celebrating the historical the times when shepherds arrived in the area to court the local nursemaids, with a procession of drummers, dancers, and toy babies carried by costumed nursemaids. Salón de la Evasión y el Turismo - mid-February, popular Spanish tourism event at the Kursaal Auditorium, with a host of holiday ideas. Annual Human Rights Film Festivals - late February, held at the Principal Theatre, with screenings of various international films. Horse Racing - early March, the start of San Sebastian's horse racing season at the local racing track. Fiesta del Aguardiente y la Queimada - mid-April, interesting gastronomic event, where many local specialities and culinary delights are served, based around the Plaza Easo. International Open Chess Tournament - mid-April, major chess competition held at the Hotel Costa Vasca, attended by many famous masters of the game. Sagardo Eguna (Cider Day) - early May, a historic local festival which was first held in 1985, with partying around the Plaza de la Constitución at noon, where enormous numbers of cider makers gather to dispense their cider, free of charge. A variety of live entertainment and music is often available around the square. Horse Races - late May, the final racing days as the end of the racing season draws close. Annual Tango Festival - late May, popular ballroom dancing event held at the Palacio Miramar. Intxaurrondo Gastronomy Week - late May, a number of international chefs attend this prominent cooking event, in the Intxaurrondo district, with plenty of demonstrations and workshops. Beer Fest - mid-June, based around the Paseo de Justo Elizaran in the Intxaurrondo area, with a vast marquee and a range of beers to be tasted. La Rioja Festival - mid-June, local street market around the Plaza de Zuloaga. San Sebastian Triathlon - mid-June, popular three-stage athletics event around La Concha Beach, attracting approximately 1,000 athletes each year. Vispera de San Juan - late June, a religious Summer Solstice Pagan celebration based around the city's Plaza de la Constitución, with music, dancing and a number of large bonfires at midnight. Jazzaldia (San Sebastian Jazz Festival) - early July, famous jazz fest which has become one of Europe's most notable and historic events of its kind, with a range of concerts at various venues around the city, both indoor and outdoor, including the Kursaal Auditorium. Much of the festival is centred around the Old Quarter's Plaza de la Trinidad, with more than 35,000 people regularly attending the event. New Book Fair - mid-July, with various new books and novels displayed on stands around the Plaza de Gipuzkoa. Annual San Sebastian Sailboat Regatta - mid-July, an exciting boat race held over two days, including racing to nearby Hendaye and around La Concha Bay. Donosti Cup - mid-July, young football teams from around the world compete for the cup. Feria de Teatro (Feast of Theatre) - mid-July, with a number of theatrical performances around the city, including outdoor stages, held over two weeks in the middle of July. San Sebastian Festival / Semana Grande - mid-August, week-long 'Day of the Virgin' event with a number of celebrations attracting crowds of visitors to the city, competitions, bullfighting and theatrical events, together with food stalls and a range of spectator sports. One of the festival highlights is a spectacular fireworks display around La Concha Bay, with the fireworks reflecting in the waterfront. Quincena Musical - mid-August, classical music festival held at a number of venues around San Sebastian, including the Kursaal Centre. San Sebastian Classic Cycling - mid-August, a challenging cycle racing both starting and finishing in the centre of the city. Annual Paseo Neuvo Swim - mid-August, swimming race between the beaches of the Playa de la Zurriol and the Playa de la Concha. Antiques Fair - mid-August, with a variety of antiques traders selling furniture, ceramics, paintings and jewellery, held at the Kursaal Center. Fiesta del 31 de Agosto - late August, remembering the historic events of 1813, when San Sebastian was overpowered by French troops and much of the city was destroyed by fire, with candles, parades, choir concerts and street entertainment. The event is based around the Eglise Baroque Santa Maria. The San Sebastian International Film Festival - mid-September, one of Spain's most famous film festivals, lasting nine days, with a programme of film screenings and an exciting awards ceremony, attracting many famous actors, celebrities and well-known directors. Euskal Jaiak Festival / Regatta - mid-September, celebrating the Basque culture, with a variety of events, including a boat race around La Concha Bay, rural sporting contests, outdoor concerts, dancing, street entertainment and cider drinking. Nixon Surf Challenge - mid-September, a notable international surfing competition, attracting many experienced surfers who arrive at Zurriola Beach to ride the waves, which are particularly strong at this time of the year. La Concha Bay Swimming Race - late September, crowds of swimmers compete at this race, swimming around 1,800 metres / 5,905 feet along the coastline. Semana de Cine Fantástico y de Terror (San Sebastian Fantasy and Horror Film Festival) - mid-October to early November, a range of horror movies are screened at various venues, particularly at the Teatro Principal, together with outdoor performances and street theatre, comedy events, horror-related exhibitions and many fanzine festivities. Elektronikaldia - mid-October, electronic music festivals held at both the city's Kursaal Centre and the Egia Cultural Centre. Classic Footrace - mid-October, a 15-km / 9-mile road race, popular with those training for the San Sebastian marathon in November. Marathon - mid-November, important international sporting event through central San Sebastian, attracting large crowds of both participants and cheering spectators, known for its fast racecourse. Exponieve - early November, skiing festival with a range of trade stands at the Kursaal Centre. Behobia to San Sebastian Footrace - mid-November, race from Behobia into the heart of San Sebastian, around 20 km / 12 miles in total, with more than 10,000 athletes competing. Semana de la Gastronomia - mid-November, many world-class restaurateurs and leading chefs compete at the Kursaal Centre. Other highlights at the event include demonstrations, workshops, tastings and trade stands. Gospel Concerts - early December, a variety of gospel concerts held at the Kursaal Auditorium, attracting choirs from the USA. Crafts Fair - mid-December, with a range of local handicrafts and gift ideas for Christmas, along the Calle Urdaneta. Christmas Swim - late December, both national and international swimmers compete at San Sebastian's Paco Yoldi swimming pool. 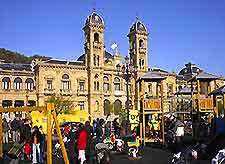 Feria de Santo Tomás (Santo Tomás Fair) - late December, a local agricultural fair held around the spacious Plaza de la Constitución, with a range of local produce on offer, together with Christmas parties and general night-long festivities. New Year's Eve - December 31st, numerous events and parties held around the city, with fireworks at midnight. San Silvestre Footrace - December 31st, race through the city centre, around 8 km / 5 miles in length.